I have absolutely cherished my engagement look, very soft and natural. Exactly how I imagined myself for the day. Thank you Joban for the lovely look that you gave me. You are such a cheerful person. Absolutely loveeeed your work and needless to say, you're truly an artist. Lots of Love! Joban you gave the look which I couldn't imagine myself for my D Day. You are one pretty soul who is expertise in your field. Thank you is not at all worth it. love you and your work. ???????? Loved my sagan/engagement look by Joban Sandhu.. She’s such a polite n nice makeup artist..Makes you feel at home n relaxed . You can rely on her for your look n she’ll do the best blending contouring n pretty eyes.. i was especially in love with the mix of lipcolors she used and the color she created.. loved the experience..Thankyou Joban Sandhu❤️Loved your work???????? 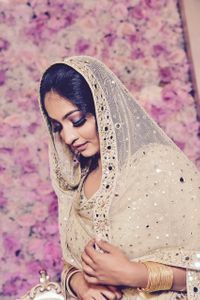 i just love her work..i am so happy that i have chosen her for my bridal make up.she is so friendly and calm.she do the things the way you want..i am more than happy and big thank to her for making my special day even more beautiful with her add ons..
Joban is amazing at what she does! I am so glad I booked her for my my non-bridal look. I was 100% satisfied with her work and the whole experience. Her whole team is very friendly and helpful. I will definitely be booking her again next year for my brother’s wedding!! Joban did an awesome Job for My Engagement and the Bridal Day. I am absolutely in LOVE with her work. I got so many Complements for all my Functions... :).. Thank you soo much.. :) :).. Definitely recommended. Joban has a great attitude towards her work. Absolutely loved how she was so confident and sure about what look she wanted to achieve. Highly recommended!! Joban did a great job on my engagement day. Natural and amazing makeup. Well done. Thank you so much . ???????????? Joban is one such person who will enhance your beauty and not make you look like a completely different person with layers and layers of makeup. Be it a bold eye look , soft day look, bold lip look .... this girl nails them all with such grace. One such person that I can trust and refer my family and friends too. Thank you Joban for the beautiful looks you have given. Such a lovely person to be with. Thank you so much for the beautiful, natural make up. I looked like the best version of myself and the make up lasted the entire day and night without needing any touch ups.I would definitely recommend your services to any future brides. Thank you again Joban! Joban Sandhu is an AMAZING make up artist . She is super sweet and she understood exactly what my Mom , Sister and I wanted . Joban and her team did an excellent job on our make up and hair . Her hairstylist understood and did exactly what I wanted . Our make up stayed on and was super fresh till we washed our faces . She is a star ?? loved getting ready from her .. the best makeup artist in town till date .. thankuu sooo mch for making me feel different and confident.. for making mee look perfect ..
Joban sandhu is nothing short of amazing !! I couldnt be more happy with her and her team . She is extremely talented , friendly and takes pride in her work . I got my look done from her for a family wedding and she did flawless work . She is quick and efficient . I think i cant go to any other makeup artist now and i highly recommend her to anyone who wants splendid makeup for any party or function . Magic in her hands. One of the very best make-up artist i have been through. In my list forever. Looking for a perfect look? Contact kohleyesbyJo ! She does an amazing job and gives the perfect look for any occasion. Keep up the good work ! Choosing a makeup artist can be tricky, you've got to trust the person to make you look amazing and choosing joban was the best decision I made ! She knows her job super well and can make you look and feel like a star ! The makeup she did for me lasted for more than 12 hours , which was amazing! She's not only a brilliant makeup artist but also a great person inside and out! For those of you looking for the perfect makeup artist do yourself a favour and book her already !!! Joban is just amazing!! She makes you look apart from the crowd !! Dont't hesitate-if you r thinking to book her for your event! She is just fantastic! Hi guys.. Jo's work is amazing.. she can make anybody look flawless with her work.. god bless u always.. lots of love and good luck for future endeavors ? ?